This procedure restores a more youthful contour of the cheek. The cheek area is an inverted triangle between the eyes and the jaw line. It is a very sophisticated structure and is made of several components and compartments. Different people have different cheek contour and volume depending on their genetic make-up. An attractive cheek has a convex and a smooth shape mainly related to the projection of the underlying bone, but also the volume of the overlying soft tissue. A flat cheek is caused by a flat underlying bone structure. As the different fat compartments and skin start to shift downwards with time and the fat loses its volume, grooves start appearing and the cheek becomes hollowed. Cheek rejuvenation aims to restore the convexity and smoothness of the cheek or the midface. Several modalities of treatment are available that address specific components of the cheek, ranging from fillers — including facial fat transfer, lifting and re-suspending the sagging tissue — to bone augmentation (in individuals with flat cheeks). Who is a candidate for a midface or a cheek lift? Healthy individuals who had full cheeks during their youth and have experienced the loss of volume and sagging in their cheeks over time. Some of the classic signs include hallowing in the lower eyelid and upper cheek, appearance of prominent grooves and deepening of the nasolabial fold. A cheek lift is most commonly performed with a facelift through the same incisions. If a patient does not need a facelift, then a cheek lift can be performed alone through a lower eyelid incision. What if I have flat cheekbones? Would I still benefit from a cheek lift? Individuals who lack projection of their cheekbone may still benefit from a cheek lift if they also have soft tissue changes as described above. A more dramatic change can be achieved through bone augmentation with specialized implants. Are there non-surgical options for cheek/midface rejuvenation? Yes, dermal fillers can be used to enhance the volume of the cheek. Small amounts are placed in specific locations to smooth the contour and camouflage the grooves. Certain types of fillers can be used to augment the cheekbone; however, the results are not permanent and re-injection in a few months is often needed. 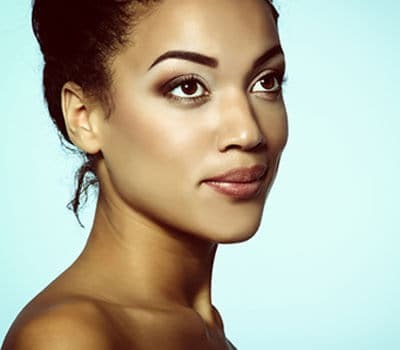 Fat grafting is another minimally invasive modality that is used either alone or in combination with other surgeries like lower lid or cheek lift for volume enhancement. Small amounts are placed in specific areas using specialized techniques. It requires a high level of artistry and thorough knowledge of anatomy of that area. Cheek lift is performed as an outpatient procedure under general anesthesia. You can engage in light activity starting the following day of surgery. Return to normal activity and exercise may take one to two weeks. Minimal bruising is to be expected after surgery and it subsides within a week. Post-operative swelling is normal, especially when fat grafting is performed, and resolves gradually over one to two weeks. Results are usually long lasting; however, you will continue to age normally. If you’d like to schedule a consultation with Chicago plastic surgeon Dr. Alghoul to discuss cheek lift, please call (312) 695-3654.